Apparently urgent requirements of small change forced the EIC to set up transitional mints and use some off the existing mints to tide over shortages. Dholera is a port town on Saurashtra area at the mouth of the Gulf of Cambay. The card accompanying the coin (which I picked up at a recent auction) says that the copper currency was minted as an emergency measure to facilitate international trade. It further adds that the mint name is written 'Dholaaraah' and are dated RY 23. It also adds that dated coins are extremely difficult to find. PS: I would love it if either Tariq or Overlord can work their magic brush on the coin so that we can see exactly what is on the coin. Very interesting story. Internal trade, rather than international trade, I suppose. I read 22, rather than 23. Might be a frozen date. From which time would this piece be? I have as much knowledge of this coin as you. 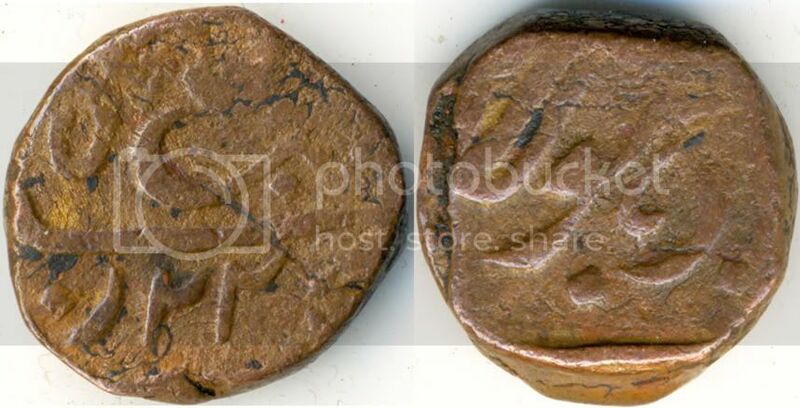 I learnt from discussions with Salvete and Oesho that such a coin existed and Paul Steavens lists one (with out an image - the message says: The requested URL /coins-of-india/transitional/Dholarah.htm was not found on this server.) as an AE Pice. This coin @ 7.5g would defenitely fit the bill. I picked up this coin when I saw it listed on the auction (as I thought that this was a once in a blue moon opportunity) and after getting the confirmation of Oesho and Salvete that this was indeed the coin. I posted it here to get more knowledge on it. PS: It is thanks to the group at WoC that I got such a great coin. Well Dholera came to the EIC in 1802 by agreement. That points to the Second Anglo-Maratha war. It would have caused local shortages of copper. International trade and payments utilise mostly silver and some gold. Copper is at best ballast, but it would have been plate, not coins. Internal trade would have been disturbed by the war, not only because prices would have soared, so that more copper was needed for daily expenses, but also because copper is a war material, so its price would have increased also. 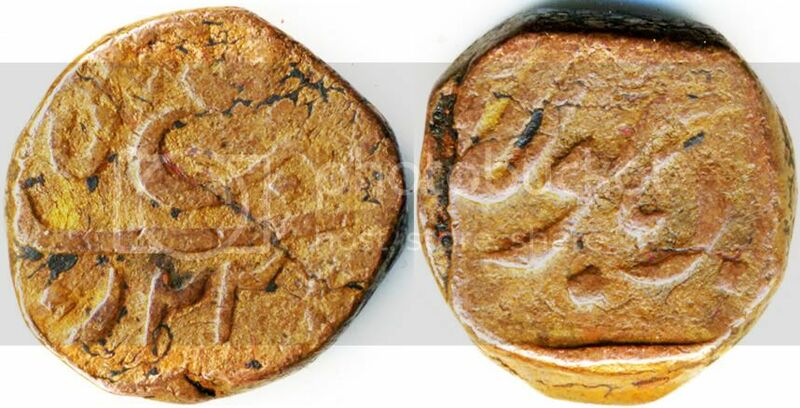 It looks like the coin was produced by local artisans and methods. Not sure how 7.5 grams measures up against standard coins of the time. I would expect it to be either correct, so that it would be readily accepted (and disappear immediately, owing to copper scarcity) or underweight, to correct for the war inflation. Whatever the case may be, you got yourself an important piece of Indian history, I think. I have some interest in this. Just down the road was the mint of Bhaunagar which closed from memory in 1840. The copper coin minted there was the Dokdo of about this weight. Is the last digit of the date readable? There is enough space out there.........It looks like a zero at times. There is, I think, a reasonable explanation for Bhaunagar which in its own way may explain Dholera. Where did you find this reference? Nothing much can be found about this place. Even the location is not clear. There is a Dholera near Rajkot. Another Dholera is described as an ancient port-city, 30 k.m. away from Dhandhuka of Ahmedabad district. It's probably this place were these rare coins were struck. Reference to that Dholera (the small port city or what used to be a port) in the Ahmedabad district is referred to an item about Dhandhuka Taluka in which the towns of Dhandhuka and Dolka are specifically referred to as being ceded in 1802. Dholera was not specifically referenced in this transaction but given later inferences on maps it appears to have been. Two things have been asked. 1. A clarification of the date. If the date is 1220 Hijri this fits. 2. Access to a copy the EIC map used for negotiations at a time close to 1802 but not before. 1806 or after would be good. Such a map will be available today I am advised. 1. The Dholera remarked by Oesho "Another Dholera is described as an ancient port-city, 30 k.m. away from Dhandhuka of Ahmedabad district. It's probably this place were these rare coins were struck." passed into British possession in 1802 and was reference as such in the Imperial Gazette India. This has been followed by a clear indication on a map drawn in 1804, after the territory rearrangements of 1803, that the township was within the Surat area that ran north through Cambay (map spelling) across the Gulf and through the Dholera area which as such was EIC controlled. Note that this has not been included in the area of Ahmadedabad subject to separate undertaking. 2. No further information on the date is to hand. My recently-added specimen of Bandar Dholarah. Far from pristine, but an important coin nonetheless. Shows almost the complete legend, but the date is off-flan. Also shown is a modern map of India with the port-town of Dhoelra/Dholarah.